If there’s hope for the Knicks this year, its name is Jamal Crawford, the six-foot-five guard who was team president Isiah Thomas’s prize acquisition (from the Chicago Bulls) during the off-season. The idea is that Crawford, a fifth-year pro who played just one season of college ball, will take the pressure off point guard Stephon Marbury and give the team a reliable second threat on offense. Thomas considers him a protégé, a player after his own heart. But how good is Crawford, really? A scout from an opposing team, who spoke on condition of anonymity, helped us assess his skills. Crawford missed most of the 2001–2 season because of a knee injury. He seems fully recovered, given that he played in all of the Bulls’ 80 games last year, averaging 35 minutes an outing. 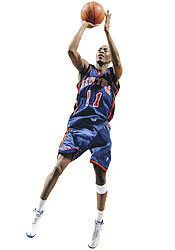 But with Allan Houston’s creaky joints, Crawford is going to have to remain healthy for the Knicks to compete.